Business cards are a networking tool. The truth is that when you are just starting out, the purpose of handing out your business card is to get one in return from the person you have just met. If you receive a card from someone higher up the food chain, that is a little piece of treasure. I keep important business contacts’ cards in clear plastic card holder page in the ring binder I use to hold my current project. Mine include the cards of vendors and rental houses, as well as individuals. 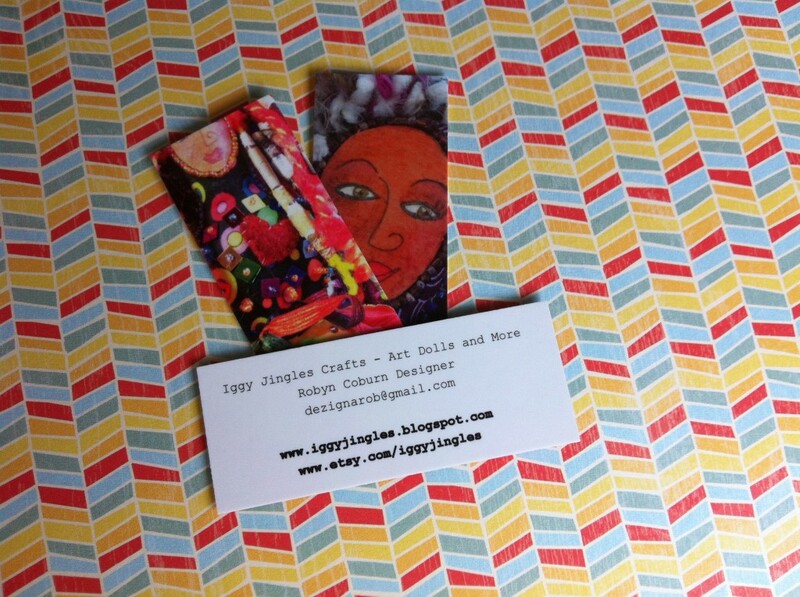 I also have several different business cards that I can give out depending on the business situation. I have a very simple and clear business card for my Résumé and Cover Letter Review business highlighting the website address and contact information. I use the back of that for my other site (Creativity Blast). Guess what? This nice and simple card was almost free from Vista Print. It is completely worth the three bucks to remove the VP advertising from the back side. I could have left it blank. These are the last of my last printing, On my next batch I’ll update it by leaving off the old fashioned “www” on my web addresses. If you are a designer of any kind with a portfolio you could certainly use Moo cards. They continue to be a conversation starter. KISS it – that means “Keep It Simple, Stupid”. 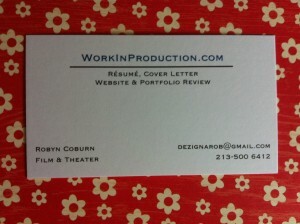 Your name, phone number, e-mail addy and job title (eg Production Assistant) are all that is needed. Use the back side to add your website (if it is relevant) or your address. Use a nice, plain, easily readable font – not a cursive script with curlicues or that wacky “party” font. Use the largest size they allow, that still takes into account the next tip. Have plenty of space so that people who are savvy have room to jot down where they met you. DON’T use one of the free decorative templates. Thousands of other aspiring filmmakers think that film reel or microphone image is cute too. Contact you (when they hear about a great gig). When you receive a card double check the name and read it aloud. You are doing a couple of things – checking the pronunciation especially of unusual names, helping to cement the face to the name in your mind, and helping to imprint yourself in the other person’s memory. As soon as you are alone, jot down on the back of the card the circumstances, a couple of words about the conversation, and anything distinguishing to help you remember your new friend. Eg. Big Movie screening at DGA (date), travel in winter, brown hair with round glasses.